Compliant drum storage requires strategic placement inside a chemical storage building. Between each drum, there should be enough room for personnel access and/or equipment access, for loading and unloading. Hazardous drum storage should be separated by type of hazardous chemical. As with any quantity of chemicals, flammable or combustibles chemicals should be compliantly stored away from other substances, especially oxidizers. Oxidizers are very dangerous and can contribute to the combustion of other substances, resulting in a hazardous situation. Oxidizers should be stored separately to prevent fires. Chemical drums should also be grounded to prevent static that can lead to a fire or explosion. Compliant drum storage can prevent serious accidents on the job as well as serious hazardous situations. Incompatible chemicals must be stored separately according to the hazardous classification of each chemical. This storage technique ensures the safety of personnel, investments and the environment. US Chemical Storage offers fully compliant drum storage for outdoor or indoor use. Store or dispense your 55-gallong drums with a fire-rated or non-fire rated compliant drum storage building by US Chemical Storage. Constructed from 12-guage steel for superior strength and reliability. All drum storage buildings by US Chemical Storage are fully customizable to meet your exact specifications. Designed with a built-in secondary containment sump for increased safety. What is a secondary containment sump? A built-in containment sump is designed to contain accidents, spills, leaks or hazardous situations inside a chemical storage building. Built-in secondary containment sumps by US Chemical Storage are EPA compliant. US Chemical Storage buildings are designed by professional engineers and experienced, certified welders. All chemical storage buildings are tested before they leave the factory to ensure a completely sealed, leak-proof structure. 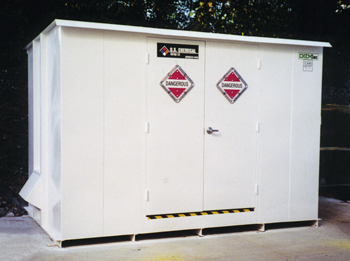 Our chemical storage buildings come with a UV resistant, 2-part epoxy coating to ensure the safety of your chemical inventory from extreme weather conditions. Meets EPA, OSHA, NFPA and FM approvals or Warnock Hersey standards.